SilverStone has introduced its first ultra-slim ODD that can read and record CD, DVD, Blu-ray and BDXL media. The drive is not a technological breakthrough, but it is going to be one of a few 9.5-mm BD/BDXL-supporting ODDs on the market. The manufacturer is primarily known for its cases, PSUs and coolers, so the launch of the TOB03 ODD demonstrates that the company sees demand for such products. Nowadays the vast majority of audiovisual content (games, music, movies, etc.) is distributed digitally via services like iTunes, Netflix, Origin and Steam. Partially due to this reason, a number of ODD makers and optical media manufacturers reduced production levels and focused on other markets. However, a lot of people still own large collections of CDs, DVDs and Blu-ray discs which need something to access the media. Moreover, Blu-ray and Ultra HD Blu-ray formats still offer the highest quality 1080p and 4K movies due to massive bitrates that streaming or digital download services do not offer, due to network restrictions for most. As a result, while demand for ODDs, in general, is not high, it exists and there are people willing to pay for such drives. From SilverStone’s point of view, these are people who buy its SFF PC cases, SFX PSUs and coolers for home theater PCs and then go to other suppliers for optical drives. From a business perspective, it makes a lot of sense for SilverStone to offer its customers premium ODDs in addition to what it already sells them. However, there is a problem. While SilverStone makes various products in-house, producing optical drives is not what it does and sourcing lasers, motors and other ODD components is sometimes tricky in a world where only a few companies produce them. Therefore, SilverStone had to find an OEM to manufacture the hardware. Apparently, there are only two companies on the planet that make 9.5-mm Blu-ray/BDXL burners: one is LG and another is Panasonic. The latter is the maker of the TOB03 and this is something that SilverStone does not seem to hide: the official photos of the drive clearly reflect that this is indeed the Panasonic/Matshita UJ272. The drive has been around for a while, but given the relatively slow evolution of ODDs in general, this is hardly a problem. Moreover, when it comes to availability of ultra-slim BD/BDXL burners, the more the merrier as right now their choice and supply are very limited. 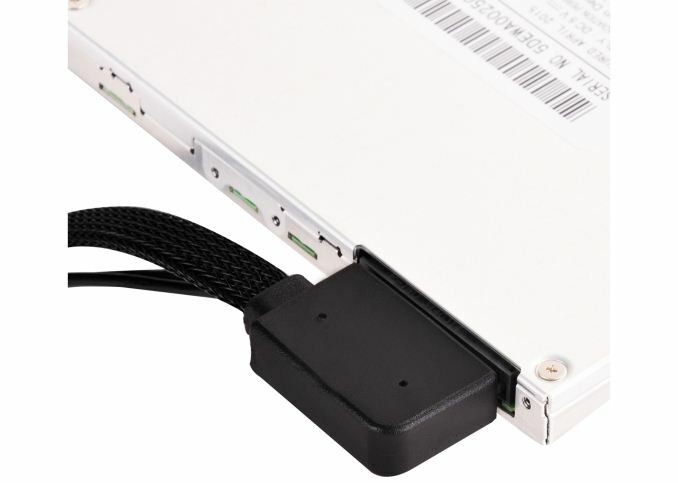 SilverStone’s offering does not expand the former, but it clearly boosts the supply by making the drive available from the company’s usual channels. The SilverStone TOB03 (aka Panasonic UJ272) uses the SATA 3.0 interface (with a Slimline SATA connector) and can read and record CD (CD, CD-R, CD-RW, HS-RW, US-RW), DVD (DVD, DVD±R, DVD±R DL, DVD±RW, DVD-RAM) and Blu-ray (BD, BD-R SL/DL/TL/QL, BD-RE SL/DL/TL) discs. 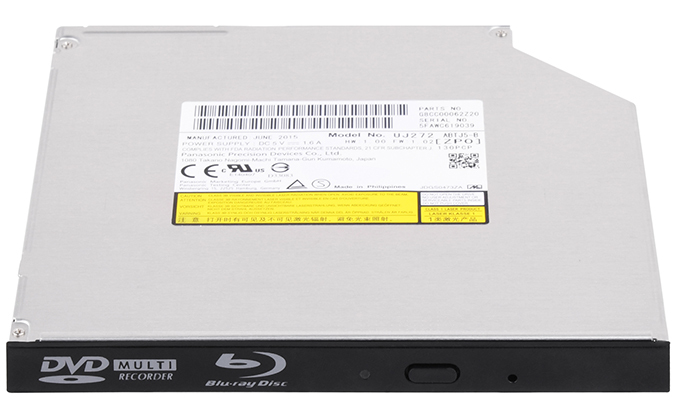 The drive has a 2 MB buffer underrun protection (which is lower compared to other high-end ODDs) and supports 6x CAV burning speed for popular BD-R SL/DL (25 GB/50 GB) media as well as 4x PCAV burning speed for BR-R TL/QL (100 GB/128 GB) discs. As for supported Blu-ray formats, both SilverStone and Panasonic declare Blu-ray and Blu-ray 3D, but not UHD Blu-ray (at least for now). Since SilverStone’s TOB03 comes in retail packaging only, the ODD always comes with a 12.7 mm bezel to be compatible with cases that support slim drives as well as a slimline SATA adapter featuring a flexible braided cable for easier installation (which contrasts to OEM drives from renowned makers that come without any cables in some regions). SilverStone’s TOB03 ODD burner will be available from the company’s partners in the coming weeks. The company does not disclose anything about pricing, but since Panasonic’s UJ272 is available for $70 to $90 depending on the retailer, expect the TOB03 to be priced in the same ballpark.